...and I don't care. We totally skipped autumn here. We went from blazing hot summer directly into winter, or maybe I should say cold, gloomy weather. 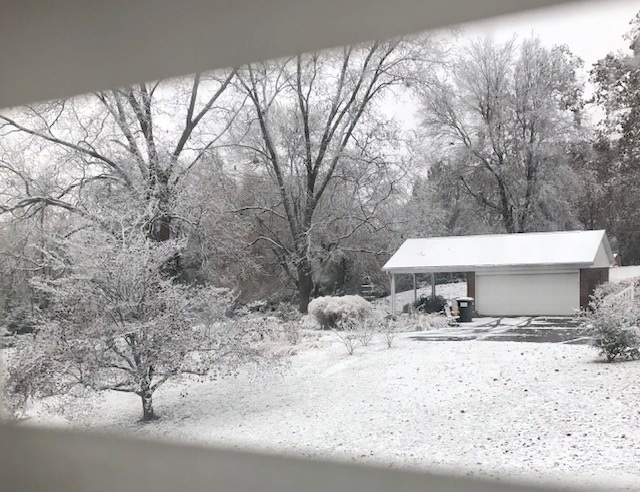 The first snow/freezing rain event happened yesterday on November 14. Way too early! The ground is covered this morning, and the road in front of the house looks slick--and it is a curvy, hilly road. Here's a view from "the penthouse", through the blind slats. I'm off work through next Tuesday...combination of birthday holiday and a floating holiday for Thanksgiving next week. My only thing to look forward to, in regard to leaving the house, is an adventure with my friend Carol. We're finally going to go to Ferdinand's Christkindlmarkt on Saturday. We've been talking about going for years! Visit Teresa's profile on Pinterest. ...as if you're life depended on it. Copyright 2007-2019 Plumwatercottage Cottage, text and images.. Awesome Inc. theme. Powered by Blogger.